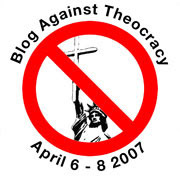 This Easter weekend, there is a blogswarm going on called Blog Against Theocracy. My contribution is a bit idiocsyncratic, namely a series of posts consisting of numerous excerpts from a book advocating theocracy entitled With Liberty & Justice for All: Christian Politics Made Simple by Joe Morecraft III. There will be a lot of material but if you are worried about the “religious right” – what I call christianism - I hope that you will take the time to read it all. Important note to new readers: As many longtime followers of my work know, my respect for all forms of genuine religious expression is a matter of long public record. Theocracy, however, is not religious, but political expression. Privately, and within his church and congregation, Joe Morecraft is entitled to worship (or not) as he sees fit. However, Morecraft is not entitled to immunity from criticism, let alone tolerance, when he heaps contempt on American democracy, distorts American history, and openly advocates the overthrow of the US government and its replacement with a sadistically violent totalitarian state. When he does so by appropriating biblical iconography and texts - which he arbitrarily and perversely interprets as providing him and his pals with a monopoly on the truth of God's will - it is Joe Morecraft, not I, who deeply insults all Christians. For the most part, I will try to limit my comment on these excerpts to brief explanations that attempt to clarify the text. I will also point to echoes of this text in other theocratic writings. For the most part, while my bias is clear, I will not try to refute anything said. Why? Well, for one thing, I have spent some four years doing exactly that, on this blog and on my own, Tristero, and in numerous comments, public talks, lectures, and papers. Detailed refutations of specific theocratic arguments – say, that the US was founded as an explicitly Christian nation - are very easy to find, by me and others. There’s little point in saying all that again. For another, I think it’s important to encounter theocratic texts for yourselves and develop your own objections. I’ve noticed that, aside from commenting on one or more obnoxious soundbites, few of us liberals bother to attend to the full spectrum of what theocrats say and do. And it’s no wonder; it’s genuinely unpleasant reading. But the problem is that those provocative, isolated soundbites provide a terribly distorted picture of what theocrats are up to. If you encounter short excerpts of Rushdoony or North, they sound crazy. But when you read a lot of their thoughts, you gain a much more detailed and accurate impression of a fascistic, demented and frightening mentality. More importantly, if you encounter only one or two theocratic arguments you may be left with the impression that modern American theocracy is a religious idea or a religious movement. That is a serious mistake. I think if you take the trouble to read all the excerpts I post here, chances are likely that you’ll conclude, as I have, that christianism is a highly influential and extremely dangerous political movement that is more mainstream than you might imagine. In order to understand what American theocracy is - and why those of us who are worried about it are worried sick over it - you need to encounter it in context and that means reading beyond deliberately tendentious soundbites like, “9/11 is God’s vengeance on a corrupt United States.” You need to see how the various pieces of their arguments are developed and interconnect. You also need to see how the theocrats deliberately manufacture opportunities to create coalitions with non-religious extremists. And you need to see how theocratic ideas have become not only more acceptable, but actually become mainstream topics of political discourse. In short, if you want to understand how to confront theocracy – and with a lot of effort on our part on a lot of different fronts, I think it can be re-consigned to the ugly margins of American public discourse - you need to find out not only what they think, but how they think. And that will take examining what theocrats say in context. Morecraft's book is useful because it is stylistically consistent and short. Also, Morecraft is unusually blunt and direct both in his language and his intentions. That said, it is not, repeat NOT, “the Christianist Manifesto.” It’s not even close. There probably is no such thing. The theocrats, for many reasons, simply don’t work like that. For one thing, there is so much they intuitively agree about, there’s no reason to bother. For another, they are way ahead of us. They know what they want; their focus now is on implementation, not theorizing. But the excerpts from Morecraft’s book will give you an excellent introduction to their genuinely bizarre mindset. It’s my hope that these excerpts dispel a lot of liberal misconceptions about the theocrats. For example, what theocrats like Dobson and Donohue mean by “religious freedom” and “tolerance” is very different than our understanding of the terms. By getting a clearer view of their rationales, deceptions, distortions, and obsessions, I think we will be better able to craft more effective ways to fight them. God knows we need all the help we can get. Later today, I will post excerpts from the introduction to With Liberty & Justice for All which was written by R.J. Rushdoony, the founder of Christian Reconstruction. Over the weekend, I will post excerpts from the book proper.